There are many flooring details to consider when designing a new school or developing plans to renovate an old one. Over the years, we’ve noticed that one of the most important accessories you’ll have to choose is cove base, which will help protect your walls from chemicals the maintenance crews will use to clean the floors, as well as from damage from rolling carts, book bags, and other equipment that teachers and students may be traveling with through the halls. There are three main factors to consider when selecting the best cove base for your installation: the type of cove base, common cove base material, and the ideal height that it should lay up against the wall. We’ll go over the basics below. Set-In Cove Base - this type of cove base is installed into the wall and onto the floor. It’s typically heat welded to the floor covering, giving you an impervious seal between the two sections. This makes the cove base almost completely water-resistant, protecting your wall from floor and carpet cleaning liquids and chemicals. This makes it ideal for areas that will be cleaned frequently, like school hallways and classrooms. Set-in cove base works with almost any type of flooring (hardwood, vinyl, linoleum, carpet, carpet tile, etc.). Sit-On Cove Base - this profile simply sits on top of the floor and goes up the wall. It provides a neat finish but isn’t as protective and water-resistant as set-in cove base. Sit-in cove base works with almost any type of flooring, but is seen most often on hardwood floors. Flat Cove Base - this type of cove base is glued directly to the wall and stops just before the carpet or flooring below. It’s typically used with carpet or carpet tile floors, and not good for hard flooring surfaces. There’s no advantage or disadvantage to flat cove base - it’s simply an aesthetic choice. Flooring with Cove Former - this is a process that can be done with carpet, linoleum, or vinyl flooring, and is often the most cost-effective choice. The process is simple - the flooring material simply runs from the floor up the wall with a cove former and capping seal. When installed by an experienced contractor, it’s no more difficult than installing standard cove base. Most often, we see contractors working on schools choose PVC cove base profiles. There are several reasons for this. First, PVC profiles are often the most cost effective. They are also easy to install and can be cut on site as needed. PVC profiles are easy to clean. This is especially important in schools where there is heavy foot traffic, lots of germs, and frequent cleaning. Other than the regular cleaning that would occur in a school, very little maintenance is required. They also come in a wide range of colors, so it’s possible to choose profiles that match the school’s colors. We’ve seen this done at several universities in Florida, where school colors are used in athletic locker rooms and other areas to proudly show school pride. 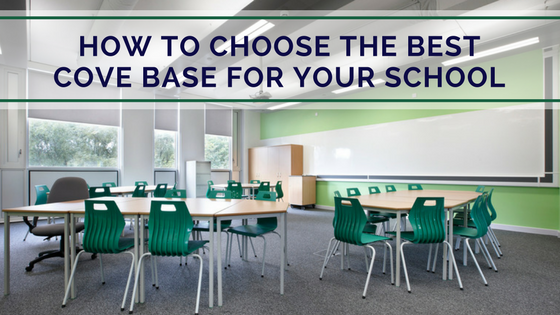 While PVC is the most common type of cove base we see in schools, there are other profiles available. If you have specific questions, we would be happy to talk with you and explore the profile that would work best for your installation. HOW HIGH SHOULD YOUR COVE BASE GO UP THE SCHOOL WALL? Another question we hear frequently is how to determine the right height for your cove base. It’s designed to protect your walls, so it’s important you choose a profile that goes far enough up the wall to provide adequate coverage. There are several factors that determine how tall your cove base should be. First, you need to know what type of maintenance will be performed. Will the school be bringing in big carpet cleaners that will splash liquid high onto the walls, or will it have a vinyl floor that only requires a mop? If you’re bringing in a big carpet buffer, you’ll want to go up at least 4-6 inches. You can go with lower coverage for a vinyl, mopped floor, typically 2-4 inches. Again, if you choose to run your flooring up the wall with a cove former and cap, you’ll have more options because you can make it as tall as you’d like. This can be done attractively and easily with linoleum or vinyl surfaces, but is not recommended for carpeted floors because you won’t be able to shampoo or vacuum the portion of the carpet that goes up the wall. Of course, every project has unique attributes that can affect the type of cove base that will work best. Contact us to discuss your project with a specialist who can help you choose the right profile for your installation.